We are a Masonry Services Company in New Jersey. 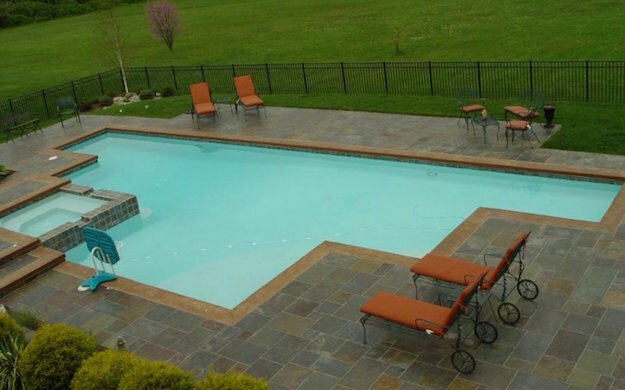 We are experts at designing, building and installing Patios, Pool Decks, Porchs, Steps, Driveways and use materials such as Stamped Concrete, Concrete, Brick, Stone, Pavers, etc. Please browse our website to view some of our masonry work in Monmouth, Middlesex and Ocean County. We offer competitive prices and our prices are very affordable. You won’t be able to find a price lower then ours! We make sure that our customers are very satisfied with the job that we do. We have excellent references and an enormous portfolio of work just ask us and we will be more then happy to show you some of the work we have done and references of recent work that we have completed! We answer every phone call. We respond quickly to your emails. Give us a call for a Free, No obligation Estimate at 732-972-3377 or fill out our contact form by clicking here. We are paver installation specialists! One of the top advantages to working with pavers is that they are durable and provide many opportunities for creating creative backyard designs. Pavers are great because they are low maintenance that last for many years. Pavers come in a variety of different styles and color so depending on your budget your pavers can be made of brick, concrete, sandstone, travertine, limestone, granite, and so much more. Let us help you decide which paver style and design will look best in your backyard. Pavers can also be used to create great features to your home such as patios, retaining walls, walkways and pathways, outdoor fire pits, fireplaces outdoor kitchens and driveways. 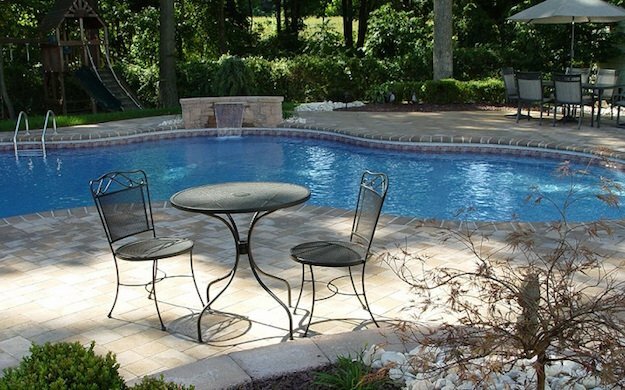 Our years of experience and competitive pricing in pavers makes us a go-to paver company in Monmouth County. An outdoor kitchen, built in grill, bar or oven is a great way to bring the indoors outdoors. Your backyard patio will transform into the perfect area to entertain guests in the summer while warm fires from an outdoor fire pit or fireplace make the patio area an ideal winter hangout. Whether you are looking for a relaxing place to have your morning cup of coffee, family hang out area or have a summer party a newly designed patio and outdoor kitchen area is the perfect solution for you! We are the Masonry, Pavers and Stamped Concrete Experts in NJ. 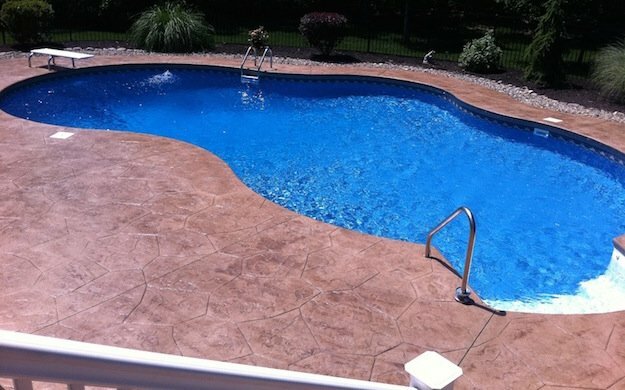 We have over 10 years of experience working on masonry, pavers and stamped concrete projects throughout NJ. We have a lot of expertise and are very knowledgeable when it comes to having your outdoor hardscape designed. We offer custom and expert solutions for your home when using materials such as pavers and stamped concrete. Not sure what to get done? No problem, that’s why we have our experts here to help you pick and choose what stone, colors, and designs to do. Looking for a masonry contractor in NJ? Our New Jersey masonry contractors can help with every aspect of the construction process. 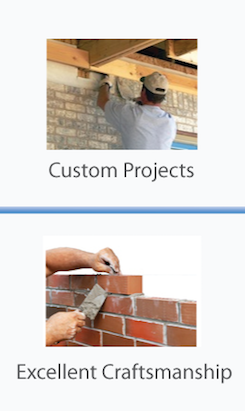 We offer services including masonry design, masonry installation, and masonry repair. We are passionately committed to getting your masonry job done right from beginning to end. We do anything from an outdoor kitchen, patios, walkways, front steps, mailboxes, wing walls, driveways, retaining walls, veneers, facades, you name it! There are many different materials, colors, designs that you can choose from when you are designing your hardscapes. No matter what service you need, we are a full service masonry contractor in Monmouth County is available at your service. Our expertly trained masonry contractors design the work of your dreams. We do anything from driveways, patios, walkways, pool decks, retaining walls, and so much more. Our masonry contractors provide you with magnificent designs. We use high quality materials on every job that we do. We are one of the top masonry contractors in Central NJ. We always get our work done on time. We bring the right amount of guys to each job to ensure that we finish the job according to time line. You won’t be disappointed with our services! 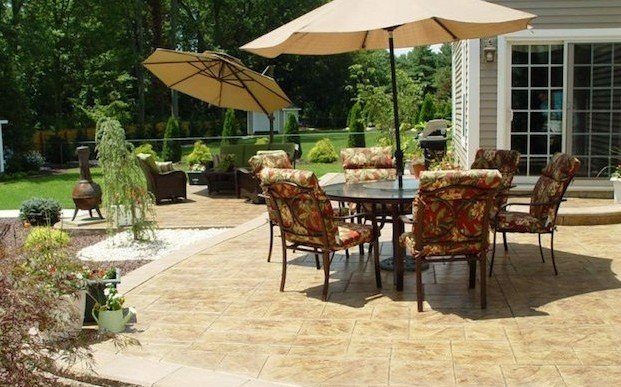 Interested in a paver patio in Monmouth County? Looking to have a paver patio done before summer? The longest lasting and most beautiful type of patio is a paver patio constructed with stone. This will need the least amount of repairs and little maintenance. A beautiful hardscape will enhance any landscaping work that you have in your yard. We give you the best product at the best price. Our concrete pavers have the widest variety of sizes and shapes. We specialize in designing and creating stone steps in Monmouth County. There are many different options when it comes to the materials you use for steps. Many people in the area go with granite, marble, or slate. Natural stone pavers create the most beautiful outdoor steps and go very nice with beautiful landscaping. You get many different choices when it comes to stones, patterns, shapes, sizes, and designs. Your options are limitless. We design beautiful driveways made with paver stones. 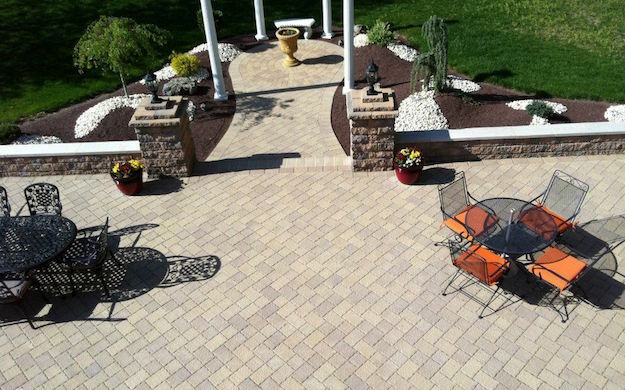 Looking to have a paver driveway in Monmouth County? You can go with slate, granite, marble, bluestone, flagstone, limestone, or even porphyry. Whether you want a walkway, front steps, wing walls, a mailbox, a driveway, patio or pool deck you can use any of these lovely stone pavers. Stone stays clean with just some power washing, no need to reseal, stain, or repair yearly. Patterns that you can choose from are running bond, basket weave, parquet, 95-degree Herringbond, cobble-lock with edger, and so much more. Want a paver walkway in Monmouth County? There are many designs, finishes, textures, dozens of colors available in natural stone. Stone is ideal to use when personalizing your outdoor projects. You can polish, flame, hone, or thermal your stone these are the different types of finishes. You may need an occasional replacement of one stone here or there over the years, but the maintenance is very low on stone. There are many different projects that you can do with pavers. We can match up your pavers with your walkway, driveway, mailbox, wing walls, and so much more! A stamped concrete patio in Monmouth County is a more efficient and affordable approach to a patio versus stone. The stamped concrete creates this “real-feel” type of texture to your patio, walkway, driveway, or any other hardscape. We have unique patterns that mimic stone textures so it looks as if it’s real stone. We help you choose the right colors to help enhance the appeal of patterns and textures. If pavers are too costly for you then stamped concrete is the right choice. Just make sure you reseal and restain your patio to keep it well maintained. Need a stamped concrete walkway in Monmouth County? A walkway goes beautifully with any stamped concrete patio. It’s easiest to get them both done at once so that way the color matches up best. Ashlar slate is one of the most popular choices of stamped concrete. We have the most wanted stamps so when you call us for your stamped concrete patio, walkway, driveway, etc we have the stamps that you want. These stamps create the imitation of the natural stone look. Granite front steps in Monmouth County give you that beautiful added touch to your home. Nothing is more classy then granite or marble front steps! When choosing granite pavers you can pick from multiple colors such as pink, crimson, black, mauve, white, gray, yellow and other hues as well. There are different options when finishing the diamond you can do it in 8 and 10, honed, polished, or thermal depending on your taste. There are also different shapes you can choose from such as circles, marquise, geometric, or diamonds. Our New Jersey Masonry Contractor Service Areas include: Manalapan, Morganville, Marlboro, Colts Neck, Freehold, Millstone, Holmdel, Middletown, Little Silver, Rumson, Red Bank, Monroe, and Old Bridge New Jersey.